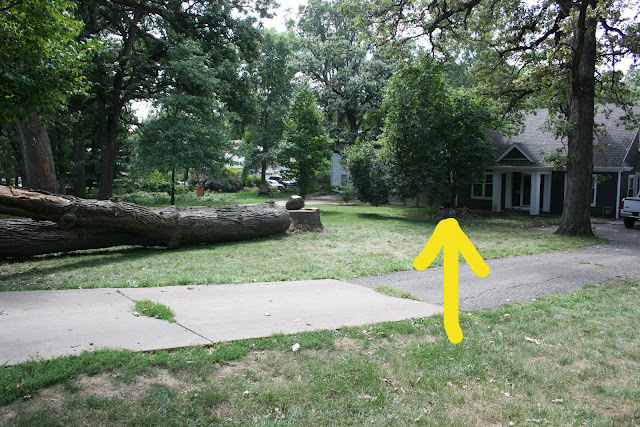 Remember this post about the tree Michael took down in June from our backyard? I followed up that post with this one about finishing up the backyard tree and how he tried to tackle our monstrously large tree in our front yard. Here's my lumberjack husband attempting to cut some limbs from the big tree back in June. He's at the top of the too-short lift. He cut a few branches down but got nervous about tackling too much of the tree. So...we started getting estimates for taking it down. They ranged from $2500-$3500. One company thought they'd have to bring a crane in because there really aren't any lifts tall enough. Apparently, dead oak trees are unpredictable in the way they will fall when cut and the limbs may not support the weight of a tree climber to cut it by scaling up the tree. All of those factors equal $$$. It's hard to get a good perspective of just how big this tree is. The one in the backyard felt big, but it was literally half the size of this one. Thankfully, some friends needed firewood and agreed to come and chop up the limbs. They were also kind enough to take the brush for us. They thought it would take a few pickup loads. Ha! Almost a dozen pickup loads later, the mess was cleaned up and we were left with the trunk. Limbs and brush cleared. But take a look at the trunk. It is 13 feet 3 inches in circumference and 41 feet long!!! That's 14,000 pounds of wood! (according to my smarty pants husband who felt the need to do the calculation) It's MUCH too large for any of the chainsaws we have or can even rent. So now we're on the hunt for someone who can handle a tree this big. The wood is beautiful and we wish we could find a saw mill with a logging truck that could use it. If you know of anyone that can handle a tree this size...please pass the info along to me. This happened to it in the last storm we had. So sad! We don't want to lose all our trees at once...especially the ones that shelter our house from full view of the road. It's a relief for that big tree to be down. I used to worry during storms that it would fall on our house or a car as it drove by. At least I don't have to worry now. But seriously, if we keep losing trees like this we're moving!